Trauma scenes are shocking for anyone to discover but they’re also physically dangerous. Biohazards like blood and tissue can spread disease and infection unless they’re handled extremely carefully. Commercially available cleansers aren’t made to sanitize and deodorize trauma scenes, and cleanup is usually more than loved ones can bear. Even worse, these areas are often active crime scenes and even the slightest disruption can jeopardize an investigation. 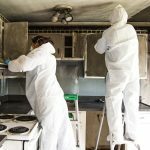 ServiceMaster 24 Hour provides high quality biohazard and trauma scene cleanup services for residential and commercial clients in Tampa, FL. Unlike other restoration projects, biohazard and trauma scene cleanup is no DIY job. Materials like blood, tissue and other bodily fluids cannot legally be discarded into ordinary garbage, even if you call for a special pickup. These materials can spread disease and infections without proper protective equipment and training handling the materials. The technicians at ServiceMaster 24 Hour have all the necessary training and certification to provide comprehensive trauma scene remediation. We’ll remove all traces of biohazards, then clean and sanitize the area so it’s safe to inhabit again. We use the most powerful and effective cleaning and sanitizing products available in the industry and we transport all biohazards in approved containers to a certified facility for legal disposal. At ServiceMaster 24 Hour, we keep in mind that trauma scene cleanup projects require sensitivity and discretion. We treat these cases with a sense of compassion and confidentiality, remembering at all times that there are human emotions involved. We work in full cooperation with law enforcement to avoid contaminating potential crime scenes. Our experts won’t just clean and leave; if necessary, we’ll help friends and family connect with trained professionals to help them deal with the trauma. If you or someone you know encounters a trauma scene in your home or business in Tampa, FL, please don’t hesitate to contact the caring professionals at ServiceMaster 24, day or night, 7 days a week, at (813) 518-8555. There are so many other tasks that only loved ones can manage at a time like this. When someone says, “what can I do for you”, ask them to call us. Let us take this burden in your time of need.